By selecting your name and then notification settings on the front end of your site, your users will be presented with a screen similar to the below where they can change various settings related to their account as seen and illustrated in the image below. 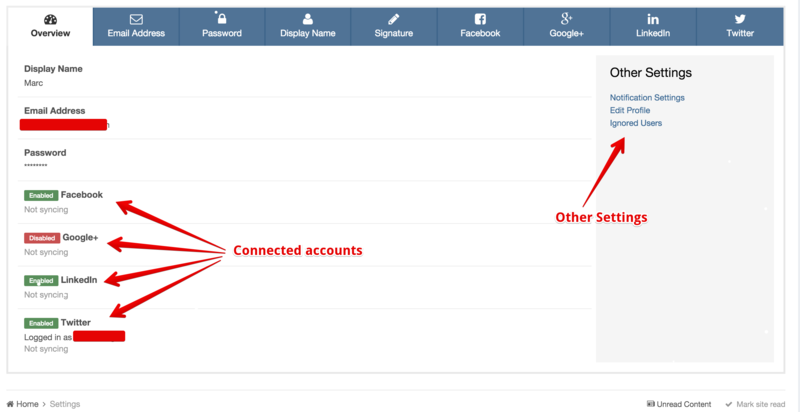 On the overview page you will see the accounts you are connected to such as facebook, google+ and more, along with links to the other settings in which you can access from this page. You will also notice various tabs where you can change your email address, password, display name and any linked accounts. When clicking to link an account on any of the available you will be given the relevant options that you can select relating to this. For example, below you will see the Facebook settings which allow you to syncronise various elements of your site and facebook. Selecting notification settings on in the "Other Settings" section of the overview page will present you with all the options for how notifications are create for you by default when creating or replying to content, along with other events on the site. In the top section of this page you will see something similar to the below. First of all you will notice on the right the "Browser notifications enabled" sign. This means that if your browser allows desktop notifications, it will notify you even when you are not active on that page. On the left you will see a series of options which will allow you to set the automatic notification options relevant to your account. So for example you may want to be automatically set as following an item of content and receive notifications for that followed content whenever you reply to an item. From here you can set this up. In the botton half of the page, you can then set up the notification types for each notifiable item on the site. So you may wish to set up notifications and emails for when someone sends you a message on the site, however you may only want to get a notification in the notification list for someone who sets to follow you. You can get to the Ignored users list by clicking this item in the "Other Settings" section of the overview page. Ignored users is a facility on your site where you can (depending on permissions) set a member to ignored in order to not see any content from that member. So if they post within a topic and you are ignoring them, you will not see that ignored content. This can be useful for filtering out people who you have no interest in reading the content of. To do this you would simply add their name into the box provided and add them to the list.